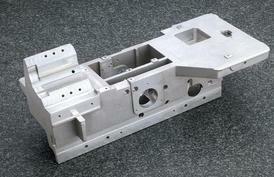 CCME provides JIT solutions on critical cast parts for companies throughout the United States. We specialize in short to mid-size lot runs to the hundreds and are capable of running lights out to maximize efficiency. Castings Machined Complete to Print Specifications, Quality Castings Machined, Sand Castings Machined with High Precision, Turn-key Investment Castings, Permanent Mold Castings Machined Complete, Vacuum Permanent Mold Castings Machined, Die Castings Machined. Castings from 5 lbs. to 4000 lbs. Maximum Steady Rest Diameter 24"
Maximum Vertical Milling Part Sizes up to 138"x36"x48"
Maximum Horizontal Milling Part Sizes up to 45"x 45"x 40"
A356, A360, A380, A383, A413; All grades of Carbon Steel, Stainless Steel, Hastelloy, Zinc, Monel, Inconel, Nickel, Magnesium and Bronze materials. Concentricity 0.0005", TIR 0.0005", True Positions 0.001", Flatness 0.0004"
Parallelism 0.0005", Straightness 0.0005", Perpendicularity 0.0005"
Compliant to 10 CFR 50 Appendix B and 10 CFR Part 21 nuclear regulations.